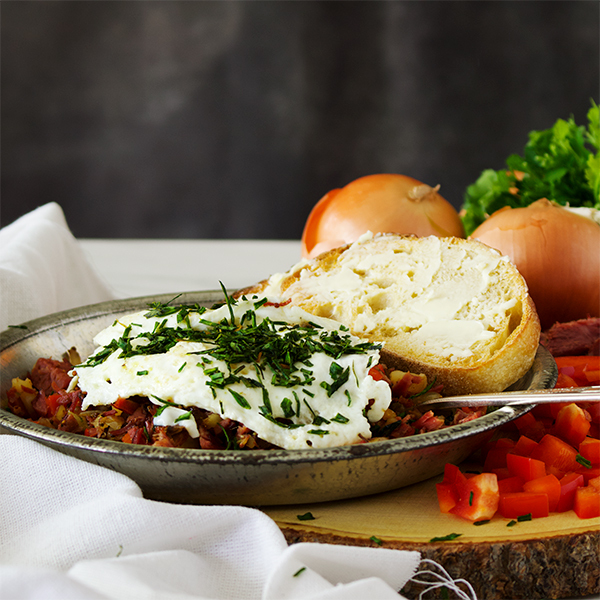 Corned Beef Hash is a delicious way to transform leftover Corned Beef and potatoes into the kind of casual comfort food that will turn anyone into a leftover lover. 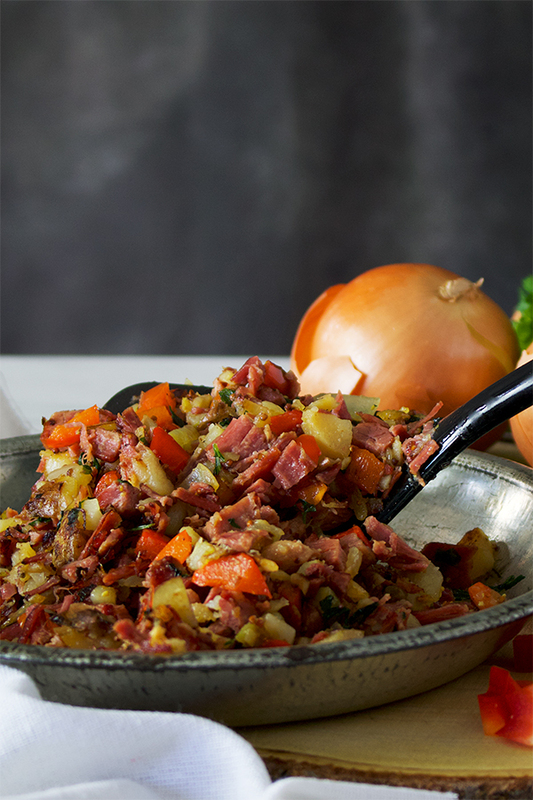 But corned beef and potatoes are just one option for cooking up a delicious hash. 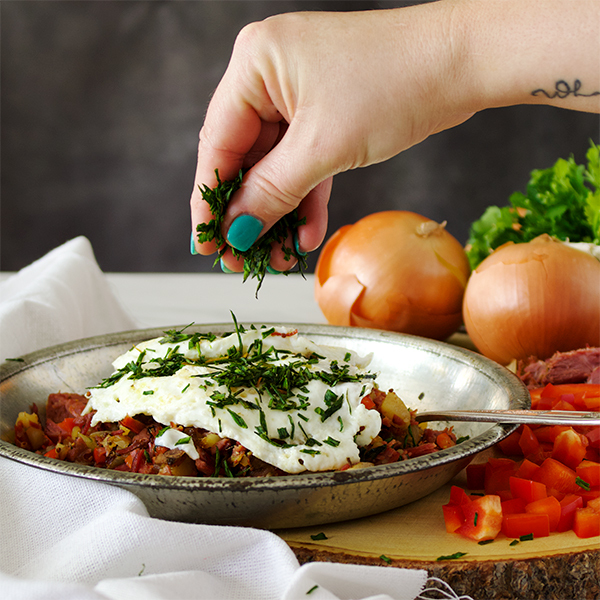 Here’s the basic formula for how to make hash with pretty much any kind of leftover meat or veggies. I am SO into really good leftovers. Do you have time to cook from scratch every day? Of course not. Me either. We have jobs and kids and spouses and friends and laundry and errands and whole entire lives to be lived. So, good leftovers rank really high on my list of favorite things. Notice how I keep adding the word “good” before “leftovers”? Not everything is made to be reheated or remade into something else. Bad leftovers are also a thing. One of the best reasons to make Corned Beef and Cabbage is for the leftovers. Leftover corned beef is good hot or cold, layered onto a sandwich, or made into hash. 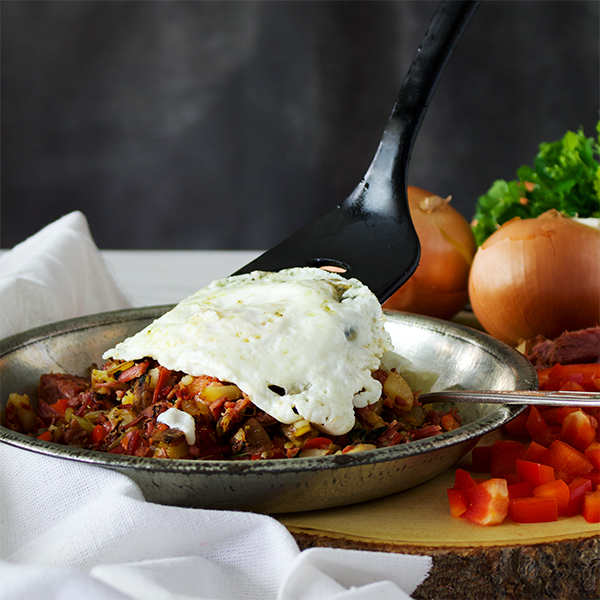 But, you don’t have to have corned beef on hand to make hash. Ham is especially good, but you could also use leftover pork chops, steak, or sausage. St. Patrick’s Day being 2 days ago, we happen to have some corned beef and potatoes in our refrigerator. And by “happen to”, I mean I purposefully made enough for leftovers just for hash. So worth it. Recipe? We don’t need no stinking’ recipe. Dice an onion and bell pepper. I like to use red bell peppers because they’re pretty. But, any bell pepper will do. Melt some butter in a skillet and cook them over medium heat until they’re soft. Dice some leftover meat. Corned beef, of course, is a great choice. But, pretty much any kind of leftover meat will do here. Potatoes! 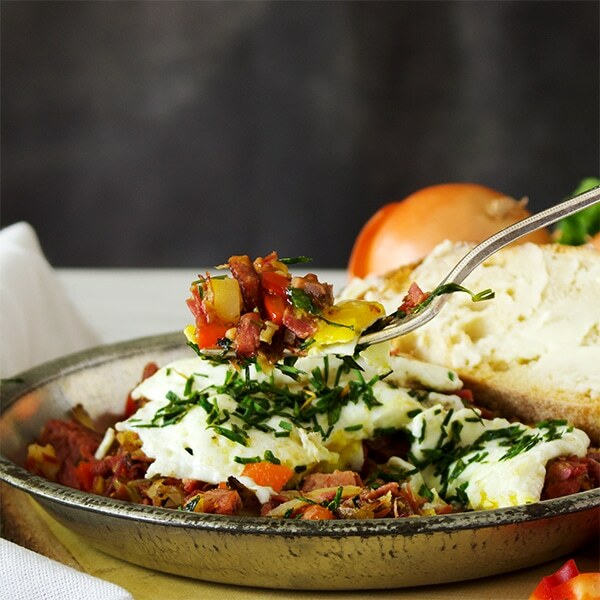 Hash is a fantastic way to use up leftover potatoes. I used the leftover parsley buttered potatoes that I served with corned beef and cabbage a couple of nights ago. Leftover roasted potatoes also work great. OR – use frozen hash browns. 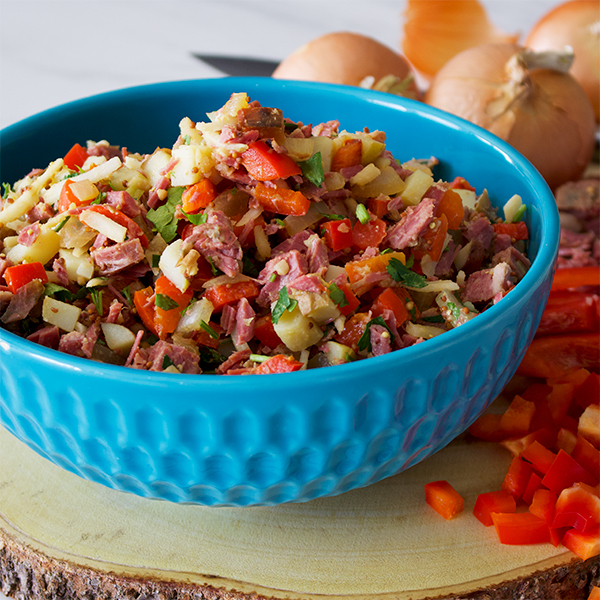 Put everything into a bowl – onions and peppers, meat, and potatoes. Add some chopped fresh herbs if you like and a dash or two of Worcestershire sauce. I also like to add a tablespoon or two of grainy mustard, but that’s up to you. Melt some more butter in a skillet and dump in 1 & 1/2 to 2 cups of hash. Use the back of a spatula to press the hash down into the pan, spreading it out into an even layer. Let it cook until everything starts to get kinda crispy. Stir it around and let it cook for a few more minutes, until everything’s nice and hot and there are a few crispy edges in there. Dump the hash out onto a plate and top with an egg or two. Or, ditch the eggs and eat it as is. But, let me just say this: the runny yolk of an over easy or poached egg is heavenly over the hash. 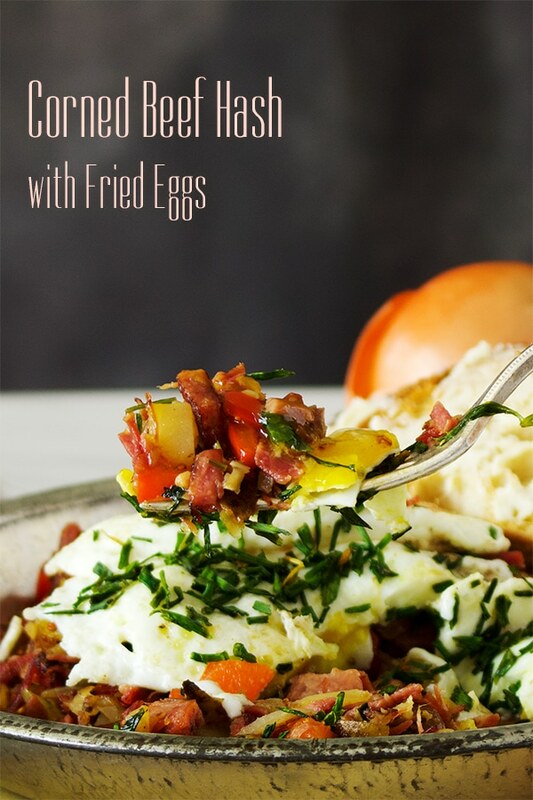 How to make Corned Beef Hash – or any kind of hash! Corned beef and potatoes are just one option. Here’s the formula for turning leftovers into a feast. Heat 1 tablespoon of the butter and the tablespoon of oil in a large skillet set over medium heat. Add the diced onions and peppers. Cook, stirring frequently, until soft and just beginning to brown. Add the cooked onions and peppers to a large bowl. Add the diced corned beef, potatoes, Worcestershire sauce, mustard, and parsley. Stir to combine. Add another tablespoon of butter to the skillet and set it back over medium heat. When the butter is melted, add half corned beef hash mixture. Use the back of a spatula to press the mixture against the bottom of the skillet, spreading it out into an even layer. Sprinkle the hash with about 1/2 tsp salt and pepper. Let cook without stirring for about 6 minutes, until the bottom of the hash is beginning to get crispy and brown. Stir and cook for another 5-6 minutes, using the spatula to mash the hash slightly as you move it around in the skillet. Dump the hash out onto two plates. Cover them loosely with aluminum foil and put them in the oven to keep warm. Repeat step #4 to cook the rest of the hash, filling two more plates, covering them with foil, and placing them in the oven to keep warm. Add one more tablespoon of butter to the skillet and set it back over medium heat. 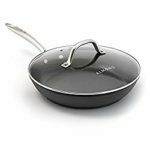 When the butter has melted, crack 4 eggs into the skillet, sliding them into the pan one at a time, being careful to not break the yolks. Turn the heat down to medium-low and sprinkle the eggs with a bit of salt and pepper. Let the eggs cook undisturbed until the whites are nearly set and the yolks are beginning to thicken but are not hard. Use a spatula to gently flip he eggs over, letting them cook on the other side for only about 5 seconds. Top each plate with one egg, sprinkle with chives, and serve.